I believe that people and concepts come into your life when you need them. If you're smart enough to put your ego aside and accept whatever it is they have to teach you, you just might find yourself growing. A novel concept for a world full of people that have come to believe in their own press, but something to aspire to none the less. 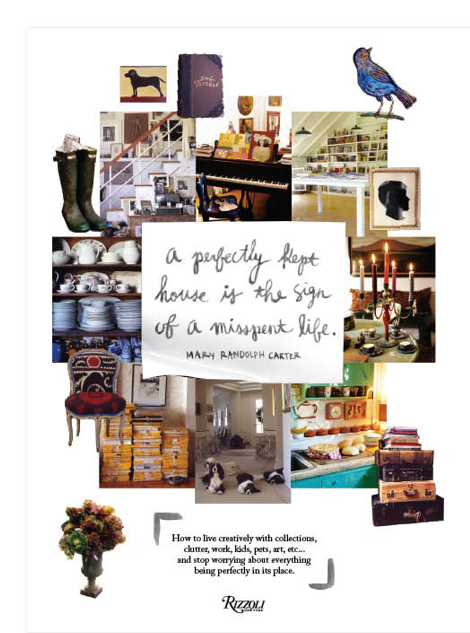 I recently had one of these enlightening moments when I read the title of Mary Randolph Carter's latest book, A perfectly kept house is the sign of a misspent life. Our tale begins one night when I was at my friend Pam's house. Wine and gossip were flowing when all of a sudden I happened to glance down at a book on her coffee table. How many times had I walked past it? How many times had I not glanced down? That night for whatever reason I did and immediately fell in love with not only the warm, genuine homes featured in it's pages, but also the vision and philosophy of it's author. Mary, or "Carter" as she likes to be called, has been setting the world on fire for many years as Vice President of Advertising for Ralph Lauren by way of Mademoiselle Magazine and Conde Nast. In addition to this coveted position, she is also the author of several books which highlight her independent, creative spirit and quirky design aesthetic which she affectionately refers to as "junking". It's immediately apparent that she is unabashedly unafraid to be herself and when I inquired about interviewing her for Austen Hill, my small little corner of the world, she also couldn't have been more lovely or generous with her time. Well....first a confession. I'm the type of person who cleans the house and then tells company she didn't have time to clean. I'm not proud but there it is......well at least it was. I told you before that things come into your life for a reason. I can be pretty hard on myself at times and in late August I looked around at my house and went ugggg!!!! I try every few weeks to clean the house (yea I don't do that every week), make sure the backyard doesn't look too overgrown and keep up with general maintenance. This summer that didn't happen because frankly I had more important things on my mind, but when I finally realized things weren't as nice as I usually tried to keep them I stressed myself out quite a bit. Luckily fate intervened and I found Carter's book just when I needed it. She highlights homes that embody her own personal philosophy about art, creativity and design; that perfection, while beautiful, is often cold and always boring. When someone surrounds themselves with the people and things they love, their home can't help but be inviting and warm. Dishes in the sink? Who cares! Don't let that stop you from inviting your girlfriends over for dinner. Absolutely no wall space left because every time you visit an antique store you can't help but buy paintings that you love? Fabulous! It's your home. Make it something that you and your family love. I needed to realize that myself. Is my home perfect? No. Is the bed always made? No. But are the walls filled with people and things I love? Yes. Thanks Carter! It's also in that spirit that I'll be featuring a new series on the blog called The Imperfect Home. Over the next few weeks I'll be highlighting homes and families here in Church Hill that are not only beautiful, but loved. So stay tuned! If you read Austen Hill regularly, you also know I frequently highlight women who I admire and hope to learn from in my never-ending quest to become a grown up. It will come as no surprise then that I asked Carter to indulge me and answer a few questions for my readers about her life, her style and her career. 1. You can only use 5 words to describe your style. What are they? 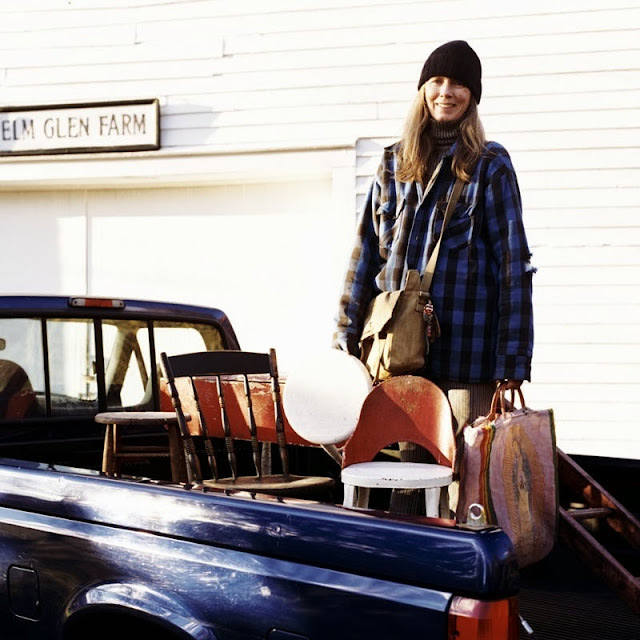 Five words to describe my style: Cluttered, personal, mixed-up, cozy and unafraid. Somebody had to tell the truth. have any tips for finding pieces for the home at antique or thrift stores? listen to anybody else, and most importantly have fun! 4. What is your favorite room in your home and why? of mementos that make me feel happy and secure. 5. Where do you find inspiration for your work and your home? Believe in yourself. If you have a bad day go home and work on a project that you truly own. fulfill us. What was your worst job and what did it teach you? my own, just me and my typewriter. It taught me that I like being part of a team. balance? What worked for you? episode of Game of Thrones and always having someone to love. 9. What book is on your nightstand right now? Javier Marais, The Lowland by Jhumpa Lahiri and in my iPad- The Cuckoo's Calling by J.K.
10. If you could give yourself one piece of advice when you were 20 what would it be? Last but not least, a big thank you to my friend Pam who didn't laugh when I proposed the idea for this interview and helped facilitate it. Thanks Pam!